Here are Dan Stone’s paper and slides. 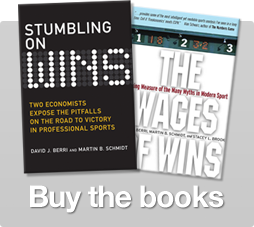 Thanks very much to Jeremy Britton for giving sports economists some nice press the other day. He did a good job of summarizing and constructively commenting on much of our work. We have to admit though that we were disappointed that, in contrast with others at the conference, Jeremy didn’t seem too convinced by our work — separate papers that happen to be on the same topic — the statistical analysis of the hot hand in basketball. (Britton described Stone’s work as “seems more a quibble” and Arkes’ work as “seems to rest on the assumption that the hot hand has to exist”). So we appreciate the powers that be at the Wages of Wins giving us the chance to reply. Quick background: all fans and players believe players sometimes get hot, and have believed this for a long time. So they believe the hot hand exists. Everyone knows this. But statistical analysis has failed to find much evidence for it. So psychologists and behavioral economists have concluded “the ’hot hand’ is just a figment of the imagination,” consistent with a vast body of research showing people tend to see patterns in noise. This has been a popular conclusion among sports researchers, being able to claim that such a common belief is wrong due to people misreading patterns. We make the case that the researchers may be the ones misreading the patterns (of research, in this case). The absence of evidence can be evidence of absence. But it might be strong evidence – and might be weak. One well known reason for it being weak is small sample size. Our work identifies new reasons—neglected by most of the previous literature in this area—why absence of evidence for the hot hand could be very weak evidence of absence. In our research, we essentially say, suppose players do get hot sometimes, in a few pretty simple and plausibly general ways. What would the data then look like? What would the analysis show? And we found that there’s a really good chance the analysis would show almost nothing – i.e. no evidence or very weak evidence of hotness – for any sample size. This is because the data do not directly reflect how hot, or not, players really are. The data are a bunch of 0s and 1s (misses or makes). But, ‘hotness’ is probably best measured, as simply as possible, as a number between 0 and 1—the probability of making the next shot (holding constant location of shot, defensive intensity, etc). In some situations, using 0s and 1s as approximations for probabilities doesn’t cause a problem. The 0s and 1s average out and all is fine. But what we show is that in the context of bball shooting data, the approximations cause a big problem—they make it really hard to detect shooting trends. So the absence of evidence here really doesn’t tell us too much. And since most of the research in this area doesn’t recognize the problem caused by these approximations, most of the research in this area that finds an absence of evidence doesn’t tell us too much. And the research that does find evidence (e.g. Arkes’ previous, 2010, paper, and Yaari and Eisenmann, 2011) may tell us much more than we realized—given our two current studies, Arkes’ original finding of a modest hot hand effect of 3-to-5 percentage points (for free throws) suggests a much larger effect in reality. We are not denying the existence of the ‘hot hand fallacy’ – the tendency to infer hotness too quickly (after say, just 2 or 3 made shots in a row). In fact, we are certain that fans and players misperceive many instances of players hitting a few shots in a row as being hot or teams winning a few games in a row as having momentum. But, not all instances. And just because statisticians don’t have the data to identify the hot hand, that doesn’t mean players don’t. They have lots of information analysts don’t–how they felt when shooting, whether the shot was a swish or lucky, the difficulty of the shot, etc. Our overall conclusion – based on the intuition, experience and judgment of millions of bball fans/players (that, of course, we only have a sense of), what’s been found and not found in the data (from bball and other sports), and our recent theoretical analysis—is that behavioral scientists have been too quick to conclude that there is no hot hand in bball, and in fact it’s likely that players do occasionally get hot, to varying degrees. We think this is kind of a fun, feel-good story – that the masses were right after all! Human judgment prevails! Now we just need to be careful not to become overconfident. 16 Responses to "Clarifying the recent hot hand research: What if it’s impossible to find what you’re looking for?" Shooting is not generating a random event like flipping a coin. It is a super complicated multifactor performance. When you get enough factors right, the ball goes in, if you are just a little off, the ball doesn’t. It is undeniable that human perfromance varies, especially when the performance is very difficult We are not machines. And performance applies to individual shots: sometimes we get it right sometimes we don’t. But it will also vary from shot to shot. Sometimes we stirng together a series of good performances. It’s jsut like a gymnast on a balance beam. They have a lot of difficult moves to make and their task is to string together a series of successful moves. That is what they are judged on. It is the same with a concert pianist. No one claims that a great gymnastic routine or pianistic performance is random luck. One place you might look is at shooters with good career % vrs shooters with average career %. A good shooter should have more instances of stings of makes. It seems common in baseball, even with some players exhibiting this behavior annually, that a player will have a month or so stretch of hitting well below their usual abilities, then correct it later with above average performance. Is this a perception flaw on my part? Might have to hit up baseball refence later to find a good example, but it seems like a strong argument for being “hot”. I suspect what you’re describing is just random variation. People tend to severely underestimate the level of “streakiness” that randomness produces. Could there be something similar at play with respect to being “clutch”? Hitting a baseball or shooting a basketball are not random. There is some randomness in the act to the extent that the various parts of the performance are not controlled, but the better you are at hitting or shooting the less randomness there is. Archers can put 50 arrows in a row into a 2 inch target. That is no different than shooting a basketball and yet there is no way you would call that random. Shooting a basketball during a game is just harder, so it is more difficult to control. But there is obviously a certain amount of control there and control is the opposite of randomness. Even if shooting a basketball during a game was so difficult that the majority of the result was due to randomness, the is still control. It is never totally random. And control varies. There will be times when your control is better and you make more shots in a series. If the Arkes paper is the one I’m remembering on free throws, it isn’t really about the hot hand for two reasons: 1) I don’t think anyone considers free throws to be a part of ‘being hot’, and 2) they are not taken enough in a small period of time to demonstrate being hot. More importantly, the original Gilovich hot hand study provided a great example for other researchers to follow that they haven’t, that I have ever heard of. They actually ran an experiment. If there’s a better way to analyze the data, why can’t someone bring in some college kids to shoot hoops for an hour or two, collect the data, and analyze it however they see fit? You can remove any worries about defense, standardize where the shots come from if you want, etc. Then you can worry about if the results generalize to an actual game if you find any evidence in an empty gym. Ultimately the question is how you use the “hot hand” in a game, if it exists to any degree. Let’s say that there is a slight (maybe 5%) hot-hand effect, and that it comes and goes rather unpredictably. So if you see a guy with a hot hand in a game, do you feed him the ball? Well, it sounds like maybe you should, but it’s a small factor that vanishes abruptly, so you shouldn’t put any more importance on it than any of the dozen other factors that also influence shot success (matchup, location, fatigue, shot clock, game scenario, etc.). I can buy that. It’s the “the basket looked ten feet wide” magical version of this, where you just force feed the hot hand the ball regardless of any other considerations, that doesn’t seem like a good idea. In other words, the hot hand is just another of many small variables for the skilled basketball player to process in the flow of the game. Kind of a snooze, but the truth often is. you are mistaking the meaning of randomness. Shot conversion is random, the fact that some players are better than others, and some shots are better than others does not mean that shooting is not random, it means that each player has their own probability distribution which, if we could find it, would say ‘player X hits this shot in this situation with a probability of Y’. A player’s shooting is merely a random sample from a series of shot distributions. Not sure what you are saying. Could you explain it to me in different terms? I think people are not looking at the question in the right way The way I see people looking for evidence of a hot hand is as an increased likelyhood of making another shot after a make. This doesn’t accurately describe what a hot hand is. A hot hand is a rare instance when you are performing the shot extra proficiently. This would show up not as the likehood of making another shot after making a first, but as a short period of high percentage shooting, something like 6 out of 9 shots or 8 out of 10. You need to look for evidence that these strings occure at rates that are not random. Really good shooters should have more of these strings than average shooters. My view on this is colored by my experience as a pool player (similar to making shots in basketball). Having good and bad days is a normal part of playing pool. Some is related to fluctuations in my confidence level that may be related to the above. All I can say is that I can perceive when I am hot and when I am cold. It feels different both mentally and physically. I’d have to think basketball players experience similar things. I’ve been playing basketball more than 40 years. There were long stretches of years in my youth where I played at least 4 or 5 days a week, 2-3 three hours a day. I have shot the ball countless, countless times. I know the feeling of a hot hand. Even just shooting around there is a noticeable variance in performance. If I haven’t played for a while and am stiff and cold, the shots won’t go in. But then as I warm up and start to get into my shooting form I get better. That’s all the hot hand is. A period where you are performing the task of shooting better. It happens shooting around, it happens in games. It’s kind of absurd to me that someone can say that people don’t shoot better at times. I wonder if the researchers who wrote the papers have played enough basketball at a high enough level to be really tuned into the mechanics and sensations of their shot. It probably doesn’t come from just casual play. You prbably have to work on mechanics and then shoot 100s of 1000s of times. So a player with 50% Fg percentage will have stretches where he misses and stretches where he hits. Over time this will regress to the mean. There’s something fundamentally different about the experience of hitting or missing a number of shots in a row, and the feeling of being “in the zone” where events on the court slow down for you, and the game becomes easier, to the point that it feels like you can do whatever you want on the court. Being “in the zone” may be akin to the “second wind” runner’s experience, or perhaps it’s a something similar to deja vu. I think some of the controversy here is due to conflating the two events. I’d be curious to know if there have been any studies that start with the times a player feels the game slow down for them, and looks to see if there’s any correlation with the player’s performance during that time. I cannot believe no one has thought about attenuation bias in the hot hand. It is something so elementary in econometrics that it shocks me no one has brought this issue up before in the hot hand. Kudos to the research! The hot hand is typically found in simplistic events such as bowling or archery (less measurement error issues) but also in tournament events such as tennis and golf. In tennis/golf the shot to shot inspection of the hot hand washes out but at the set/round level it can be found. I think to understand being “hot” you have to actually experience the mental and mechanical differences a player experiences over time. Even though some of it is a probability problem, some of it is a fluctuation in actual ability related to your mental and physical condition.